I’ve been looking for more ways to get involved on the blog without having to write so much (I’m lazy, I know). This week I was really lucky to read Angie Americana’s Christmas Tag post as part of her Blogmas post series. It reminds me of the days of MySpace questionnaires and couldn’t help but get the urge to fill it out myself. Hope you enjoy! 1. What’s you favorite Christmas film? How can you pick just one? I can’t so I’ll divide it between my favorite animated film and favorite live action film. Home Alone definitely takes the cake in the live action category. Because duh, it was every kids dream to be Kevin! The Nutcracker Prince (1990) is my favorite Christmas animated film. My sister and I used to watch it on loop growing up during the holidays. It really isn’t Christmas until we dust off the VHS player, make popcorn and drink hot chocolate while watching it. Nope, I wish. Especially since every Christmas in the foreseeable future is going to be during the summer. 3. Where do you usually spend your holidays? Up until three years ago I spent my holidays in Miami. But when we moved to Uruguay we’ve been here. ‘Jingle Bells’ by Frank Sinatra. Best. Song. Ever. 5. Do you open you presents on Christmas eve? Honestly it depends on the year. Growing up we were allowed to open one gift on Christmas eve and would have to wait for Christmas morning to open the rest. But as I got older we would just open them on Christmas eve. Now that Paloma is around we’ll probably go back to opening gifts on Christmas morning. Nope! I’ve never been good at remembering any of them except for Rudolph. 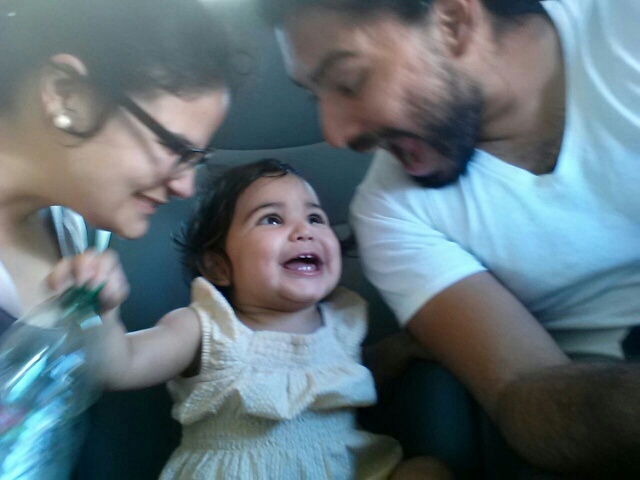 Right now I’m most excited to start new traditions with Carlos and Paloma. We put up and decorated our tree the day after Thanksgiving as a family. 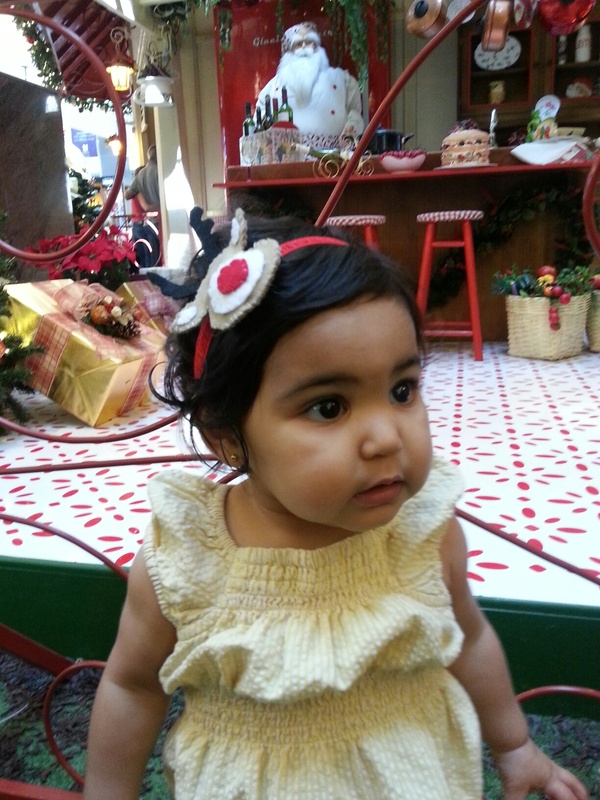 We are taking PJ to meet Santa sometime in the next few days. As Paloma gets older I’m sure we’ll develop and add new traditions. It’s fake! I miss the smell of pine trees around this time of year but sadly Uruguay doesn’t offer real trees. [See featured image above]. 9. What is your all-time favorite Christmas sweet/treat? Turron. And not the soft, mushy kind either. It needs to be jaw-breaking hard. Mmmmmmm…. 10. Be honest: Do you like giving gifts or receiving them better? I love giving gifts! I like to think I’m really good at it. I spend MONTHS researching and really listening to everyone to see what would be the best gift. Oh man, that’s a tough one. Right now I’d have to say it was our last year in Miami. I had been wanting this Marc by Marc Jacobs purse for ages and Carlos said we couldn’t afford it. But he ended up surprising me with it on Christmas eve. I still use it every day and it’s in perfect condition. 12. What would be your dream place to visit for the holidays? Anywhere that it snows. I would LOVE to experience a white Christmas. 13. Are you a Pro present wrapper, or do you fail miserably? Oh man, I’d say I’m average. I don’t really put much effort into gifts given to my family members because I know how savage we are at unwrapping. But when it comes to extended family or friends, I put more care into presentation. My last Christmas with my grandpa. He died on Christmas eve when I was seven, causing a lasting and lingering cloud around the holidays, but before he passed he spent the evening with us. I remember opening my gifts from him and freaking out over a Little Mermaid nightgown. I remember the smile on his face as I jumped up and down like a sugar-addicted kangaroo. I don’t know, just something about that moment always makes me smile. No idea, but I’ll bet it had something to do with my sister. Every year but I always break them. I can’t even remember what my resolutions were for this year–I’m sure there’ll be a post on that coming up–but I can tell you if I accomplished one it’s one too many. My family. It’s going to be weird celebrating Christmas this year without my sister. Posted on December 10, 2015 December 26, 2015 Categories Holidays, PersonalTags christmas, christmas tag, expat, expatriot, personal1 Comment on O Christmas Tag! 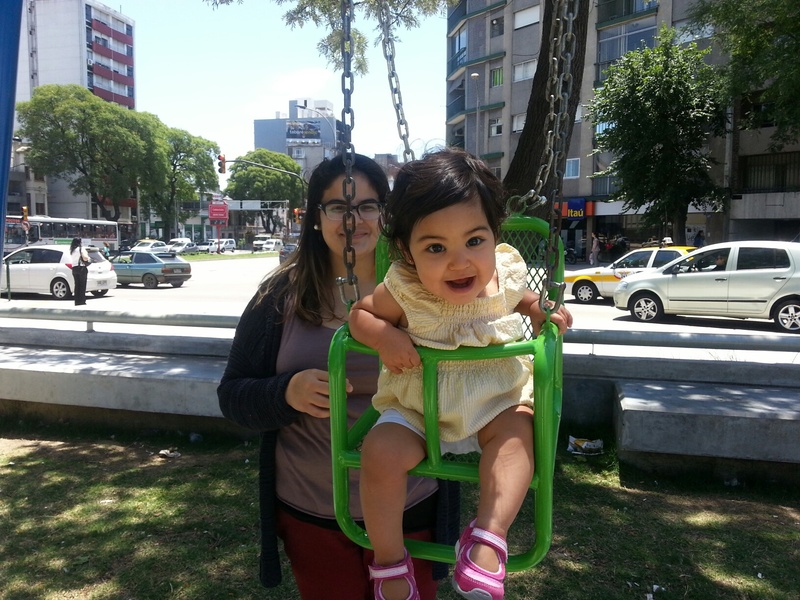 This was our second Christmas in Uruguay. I don’t think I’ll ever get used to spending the holidays in the summer but I don’t really have much of a choice. Most Hispanics will tell you that REAL Christmas is on December 24th, aka “Noche Buena,” and the 25th is really just a day to recuperate from all the drinking and eating the night before. In Miami I used to spend Noche Buena, again like most Hispanics, bouncing from house to house. I would always start with dinner at my house, then head to my in-laws houses, and proceeding to go to my husbands extended families houses. It was a long night of eating and trying to gauge on how to stay sober enough to drive (this was obviously pre-baby). Christmas in Uruguay, while yes they celebrate the 24th, is a bit different. The 24th is dedicated to spending time with family but the real party starts on the 25th. At midnight they shoot off fireworks and open their presents from Santa, aka “Papá Noel,” and do whatever else they do. I wouldn’t know what they do after the fireworks because I’ve been in bed by the time the fireworks go off two years running. On the 25th they usually have barbecues with friends and spend the time talking and eating. Some families spend their day at the beach or lounging in their inflatable pools. Since summer starts a few days before Christmas here, a lot of people spend their Christmas on vacation in Punta del Este or Brazil. Lounging on beaches and enjoying the sun doesn’t really FEEL like Christmas to ME but I’m sure most people on the north side of the equator would feel the same. This year while sure we ate our traditional Cuban meal of lechón with white rice and black beans, it just didn’t feel like Christmas. I can say that I loved that Paloma loved her gifts. This year we got her a slide, puzzles, one of those pull string walking toys and a scoot car toy. I love her reaction every time she goes down the slide! She laughs and laughs and has now tried climbing UP the slide. I would have taken pictures but let’s be real I was too busy trying to control my panic attack. Christmas morning we had breakfast and watched Disneys A Christmas Carol and Home Alone. Home Alone was the first movie Paloma actually sat and watched the WHOLE thing. She’s got great taste. It was nice to spend time with my family without worrying about other things, which at the end of the day is what the holidays are about. 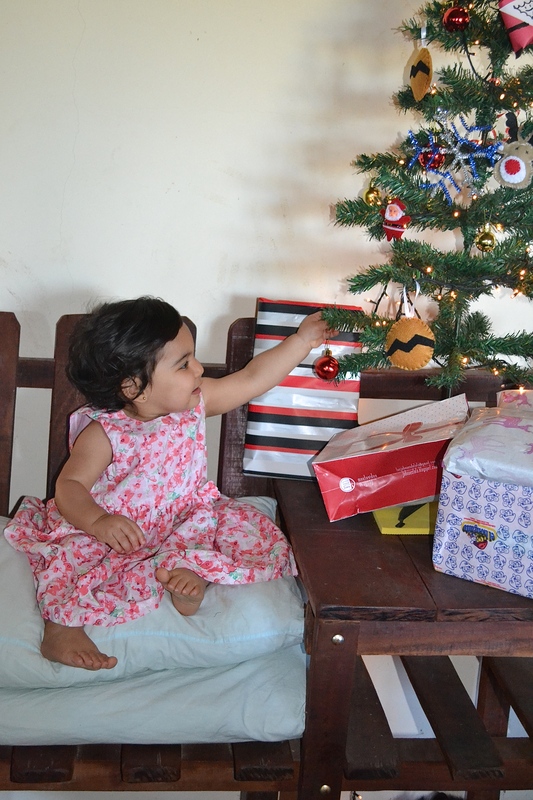 Paloma enjoying our Charlie Brown Christmas tree! Posted on December 26, 2014 January 31, 2015 Categories HolidaysTags american, christmas, expat, expat life, mom, motherhood, papa noel, Santa Claus, uruguayLeave a comment on Merry Christmas! I’ve got Christmas on the brain! It’s one of my favorite holidays and I want to share that with my daughter. 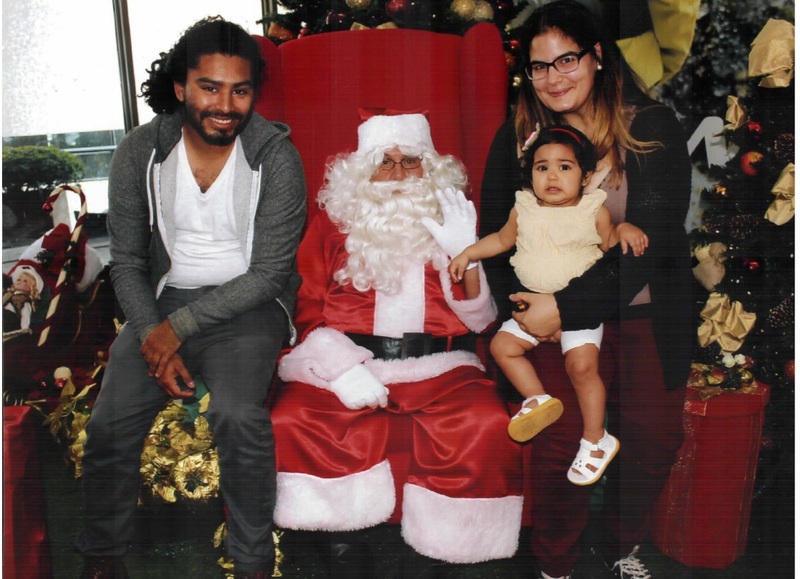 Last week my husband and I decided it was the perfect time to take Paloma to visit Santa Claus. Friday was the last day of school in Uruguay until February so we thought going any later in the season would result in long lines and overly excited children. 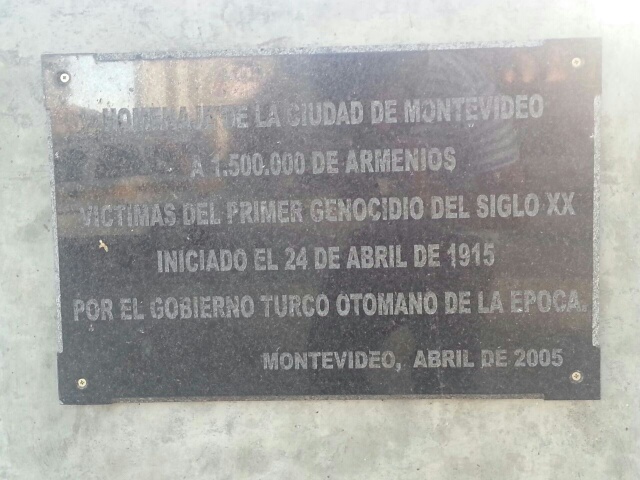 On Thursday, my husband and I packed the baby bag and headed out for Montevideo (from now on referred to as MVD). We live in a small town called Sauce–pronounced saw-ou-seh–which is about an hour and half bus ride away from the capital. Since Paloma was born, I’ve only gone to MVD a handful of times because it’s too long of a ride with Paloma since she starts to squirm not being able to run around. It’s funny though because if we take the car to MVD she can handle it but the bus ride is just too much. I think it has to do with the new people, new sites, new sounds thing. Anyway we took the bus to MVD, and got off at Tres Cruces. Tres Cruces is a bus terminal in MVD which doubles as a mall. 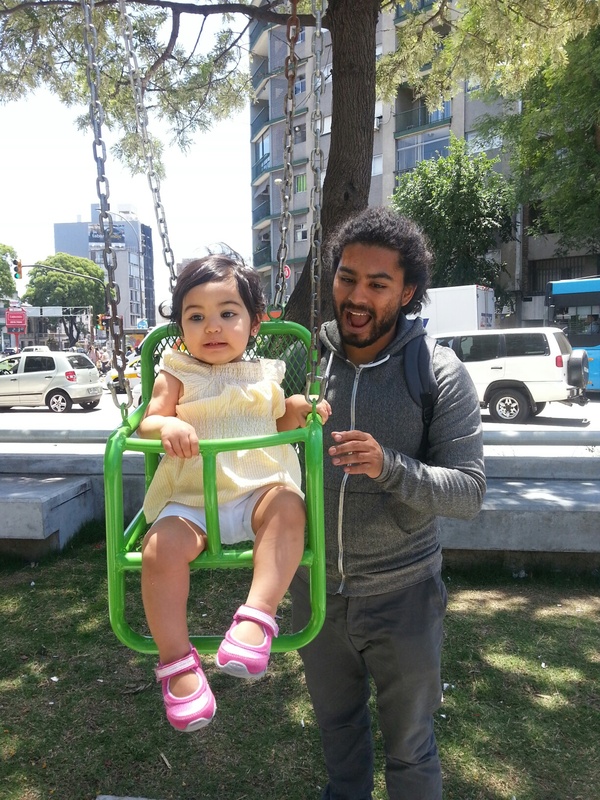 They just opened a new jungle gym in a park dedicated to the Armenian Genocide of 1915 across the street and we decided to take Paloma there to use the swings. She loved them! She loves seeing the older kids run around the park and tries to chase after them but she’s just too young. I always tell her one day she’ll be able to play with them but you can tell it’s not good enough for her. After a few minutes we started on our way for the taxi stand to head to the mall. On the swings with mommy! I don’t know about you but whenever we take a taxi with Paloma, I’m freaking out about the lack of car seat in the taxi. I mean sure we don’t have one on the bus either but the bus drivers aren’t as crazy as taxi drivers. Most of the time I’m holding onto her for dear life, cradling her head to protect it from the plastic/glass barrier. Anyway, so once at the mall we decided to eat lunch at a small café around the corner called Philomene. I wish we would’ve snagged a picture of the actual café or the food but we were too distracted. It’s a quaint little place on the corner of Solano Garcia and Miñones. The inside of the café is small but not crowded, and I fell in love with the bathroom. It’s upstairs and tiny but it didn’t feel cramped. When and if you ever visit Uruguay you’ll realize why one would notice the bathroom. After we finished our meal we headed straight for the mall again. Punta Carretas Shopping is my favorite mall in Montevideo. It actually used to be a prison at some point in Uruguay’s history but I don’t know much else about its time as a prison. When we walked inside you couldn’t help but notice the Christmas decorations. I was in heaven! 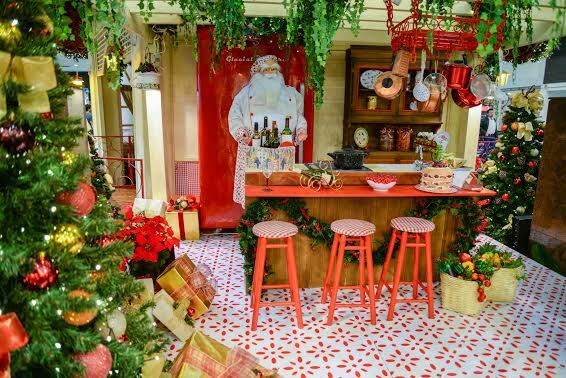 They had a three story tree in the middle, surrounded by little Christmas scenes like Santa in his workshop, carolers singing, and an animated Mrs. Claus in their living room talking to the visitors. I couldn’t get a good picture with my phone so I’m borrowing a picture from the local paper. Picture credit to El Pais. Paloma went crazy running around so I couldn’t get a good picture of her here either but just so you can get an idea I’ll add some more from the paper. 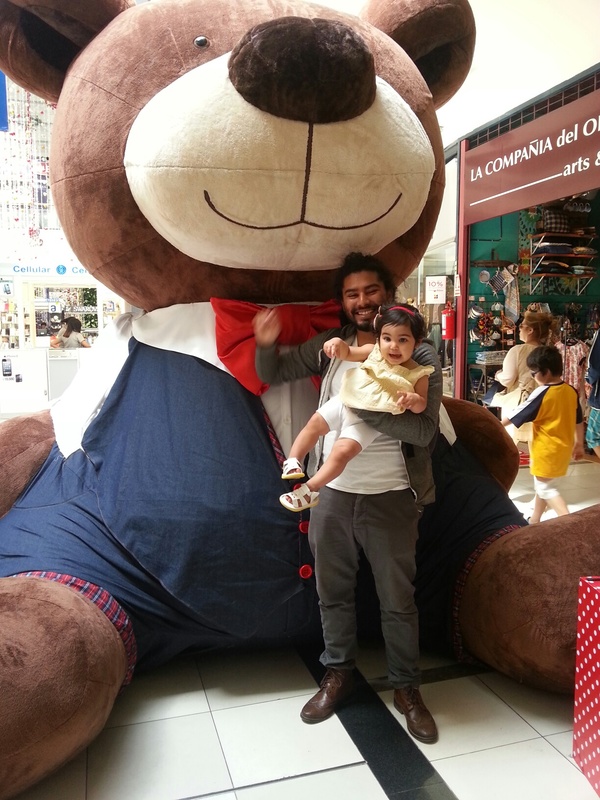 Paloma with her daddy in front of the giant teddy! Paloma in front of Santas kitchen. After getting lost around all the beautiful scenery looking for Santa, I caved and asked one of his “helpers” (a.k.a. two high school aged girls standing around looking at their phones giving off a “GO AWAY” vibe) where we could find him. Third floor. Food court. Seriously, you have this beautiful scenery and you put Santa on the third floor next to the food court? But I digress. Off we went to visit Santa. Luckily there was no line. We paid our $130 pesos for our picture (roughly USD $7). Paloma is usually really good with strangers so I didn’t think twice about just handing her off to Santa for the picture. WRONG. WRONG. WRONG. WRONG. Paloma HATED Santa. I’m talking full blown crying, screaming, and just overall awful. I will say this is the first time I’ve experienced/heard a Santa hand a screaming baby back to it’s mother before the picture. I swear through his bushy white beard and long hair his piercing eyes were letting me know he wasn’t having any screaming baby on his lap. I already paid for my picture so we made it a family “portrait” instead. Paloma sat on my lap while I sat next to Santa and Carlos sat on his other side. The elf was really nice and helpful but Santa was just not having it. After our encounter with Santa we picked up our picture, were welcomed to Uruguay by the guy manning the printer (which doesn’t happen often, seriously he was SO NICE), and walked around the mall aimlessly. After about half an hour we decided we should head for the bus stop to head home to avoid afternoon rush hour. The bus ride home was no longer or shorter than the bus ride there, but I will say that the lady sitting next to us was nice and understanding of my hyper toddler. She played with her for about the first forty minutes, allowing Paloma to pull her hair, touch her mouth and scream for attention. I wasn’t too excited about it but honestly I was too tired to care at that point. After the lady got off the rest of the bus ride was spent playing with Daddy, looking out the window and trying to touch the head of the man sitting in front of us. The light of our lives. Overall we had a really nice day out as a family. It doesn’t happen too often since we don’t have our own money to go out. But when it does, I really enjoy spending the time alone just the three of us.